I’m happy for the stutterers of the world. But this story made me think about so many other things related to our health that we try to find an “out” for, something that makes it not our “fault.” The more we learn about the contribution of genes to human health, the more stories like the stuttering one we’ll hear. The thing is, our genes do not operate in a vacuum. Just because I have a gene or genes that increase my risk of lung cancer doesn’t mean I’ll get it. But add smoking to the mix–an environmental component–and it’s much more likely I’ll develop lung cancer as the environmental stress combined with the genetic mutations turn on or off the underlying biochemical processes that trigger cancer growth. The same could be said for nearly any condition for which a genetic component has been identified. We know, for instance, that some people are just genetically predestined to be heavy. You see it in their families going back generations. The question is, just how heavy? A genetic predisposition towards obesity is not a get-out-of-jail-free card to hit the all-you-can-eat buffet on a regular basis. Instead, it’s a warning light that I have to be even more vigilant than my peers in terms of exercise and diet, much like someone with a genetic predisposition towards high cholesterol has to limit saturated fat and other cholesterol-creating foods more so than someone without those genes. In other words, don’t blame the genes. That’s like blaming the computer for crashing when you’re the one who operated it without virus protection, or blaming the car for crashing when you’re the one who drove 30 miles over the speed limit while texting. By all means, learn all you can about your genes–there are even tests you can take at home that will provide information on your risk for hundreds of genetically-linked conditions–but know that risk is only a word. You still, to a large extent, control your medical destiny. Thanks everyone for the comments. . . you “get” it! I think what the general public thinks (and how the lay media portrays) about genetics is that it's an either/or situation: Either your genetics or the environment are to blame for health issues, when the reality is much more complicated and interrelated. 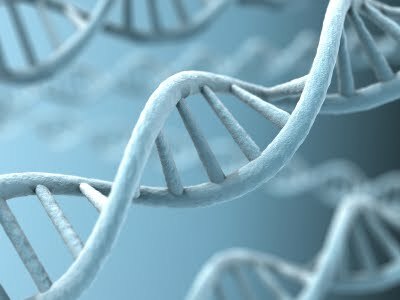 Throw epigenetics into the mix and it gets even more complex! In all seriousness, your take is right on. For instance, I've been able to live a fairly normal existance simply because I've addressed a bad genetic profile with positive action: exercise, supplements, light box, etc. We're all genetically destined to get or have something. It's what you do with your genetic heritage that makes life worth living. Eric, this has been an issue in the lung cancer community for years and years. In fact, some researchers have even suggested that the lack of advocacy and research funding for lung cancer is due in part to the prevalent “blame the victim” mentality that exists in our society. Think how many groups are out there raising money for breast cancer research, for example, yet can anyone tell me what color the lung cancer awareness bracelet is? I read somewhere that one suggestion was to make it translucent, since lung cancer advocates are an “invisible constituency” due to this stigma. I've worked in the field for 20 years, and when my own father was diagnosed with lung cancer in 2009, I found myself saying the same thing, “But he stopped smoking 40 years ago.” I couldn't believe I'd fallen into the same trap of “defending” his diagnosis. That's how powerful and prevalent the mindset is. Lung cancer is a horrible disease with a very poor prognosis once advanced. Sure, I'd love to live in a society where everyone made wonderful personal choices (healthy diet, plenty of exercise, no smoking…), but we don't. And as long as tobacco remains a legal product in this country that can be marketed broadly, we need to stop blaming people who develop lung cancer and show them our compassion, no matter what. I wouldn't wish a lung cancer diagnosis on anyone. No one “deserves” it. As a Ph.D. student in human genetics, I'd like to point out that there is a broad spectrum of phenotypes/diseases with different types of underlying causes. For simple Mendelian traits, a certain genetic mutation will always cause a phenotype, regardless of the environment or lifestyle of the individual. Your examples are of more complex diseases, with both genetic and environmental components. This is the most common type of disease, but for most of these diseases, we don't have the best handle on how big of an effect genetics has vs. environment. For example, many personality traits that can influence a person's lifestyle (susceptibility for addiction to cigarettes, or impulsivity to eat in binges) appear to have some genetic component. I'm not trying to say that *everything* is genetic, but there is a lot of complexity in assigning causes. I've always been fascinated about why the media *always* discloses a celebrity's smoking status when they die of lung cancer. When Dana Reeve died of it, all the stories carefully explained that she didn't smoke, but used to be a singer who performed in smoky places so it would be, you know, OK to feel sorry for her.